Science says that not only is it possible , it is very likely that your pain and disease is caused by the unresolved pain and trauma in your childhood. Science has also discovered that forgiveness can resolve the trauma that creates physical and emotional suffering in your life. This is why EPT™ is so effective in ending emotional pain and suffering. In this podcast, I will tell you about these two scientific discoveries that explain why EPT™ works so well to change your life for good. Now you can end the stress your life adversity is causing you and free up energy to create more of what you really enjoy in your life. Don't you love learning faster, amazing ways of helping someone heal? The more techniques, tricks and remedies you learn, the more you realize how infinite healing resources are. As you learn more and more, your healing bag becomes full and overflowing with incredible ideas, techniques and remedies to help people get well. Hi friends! Welcome to episode #59: The secret to unlimited abundance. -How you can use this secret yourself to influence a flow of unlimited abundance in your own life. The secret to unlimited abundance is giving: not just giving to get, but really opening up and giving from your heart. We all know it is better to give than to receive; what we may not really understand is why this is the case. It’s simple, really—the more you give of yourself, the more you will receive. By releasing energy, you open a space that must be filled. When you give freely and unconditionally, success and abundance will naturally flow to you. There is a universal law of giving and receiving. This law is as sure as the law of gravity. Like the law of gravity, the law of giving and receiving can be observed as a natural force within the universe. When you give of your time, energy and resources with no strings attached, you instantaneously set the law of giving and receiving in motion. You become a magnet, attracting success and abundance. In this episode, you get to listen to three sisters, Annette, Linda and Sherry, discuss how to get skinny and stay skinny with EPT. Each sister's unique history of struggling with body weight and body image. What made the biggest difference for each one of them. The turning point emotional issue that worked for each of them. We will also include thoughts and ideas about eating to enable feeling vs. eating to stop feelings. Finally, we will give you the best healthy eating actions you can learn to take to stay skinny along with some fun tips for healthy food options that can take the place of the unhealthy food you love and crave. Listen and be inspired to move in the healthiest direction for your body, life and future. In this episode I’ll be sharing part 2, chapter 8 from my book The Forgiveness Doctor. In this episode, I’ll be sharing part 1 of chapter 8 from my book, The Forgiveness Doctor. Dr. Annette Cargioli and Sherry Hamilton continue the chat about making forgiveness statements in this spontaneous conversation we recorded, so you can gain even more insight into the energy of words and forgiveness in the context of helping others with Emotional Polarity Technique™. This is an interview with Sherry Hamilton sharing her best tips for making incredible forgiveness statements. Hi everyone! Hopefully, you are already feeling much more confident with step 4 Forgiveness in the EPT healing strategy. Step 4 can be challenging for many people because it requires a faith in jumping into the flow that is already there for you and your client. This 4 part podcast series is designed to help you to really get good at creating forgiveness statements that have the greatest impact on igniting new life in your clients. Even if you feel pretty good about your ability to make those forgiveness statements and affirmations, I’m pretty certain this 4 part series will still kick your statements up a notch. If you are still insecure about applying this aspect of EPT, I encourage you to listen to this series more than once. I guarantee it will sink in and you will find yourself more confident with making statements than ever before. It’s all about getting in the flow of forgiveness which happens to be the title of this episode: Getting in the Flow of Forgiveness. I know you can become a genius with forgiveness statements, just like the EPT practitioners who seem to easily flow the most profound forgiveness statements and let’s admit it here—sometimes it can be quite intimidating to try your hand at this new flow of forgiveness when there is someone who is already quite comfortable with it. Rest assured that no matter how advanced another practitioner seems to you, they also took this same journey you are taking to get good at forgiveness statements. I want you to just let go of the fear and intimidation, relax and let this information sink into your mind. It’s just a new way of thinking. Let your mind take it in. I will review all of the types of statements I have already talked about that are most frequently used in step 4 of the EPT healing strategy. I will also add one more powerful statement that comes in the form of a prayer. Hi Everyone! Thanks for listening, but more than that—thank you for opening your heart to the power of forgiveness. I’m sure you have made it this far on this series because you have an amazing heart to help people release the burdens that hold them back from greater awareness of God’s love for them. You are listening to episode 52. This episode is part 3 of a 4-part series on Forgiveness. It is titled How to Form Great Forgiveness Statements. It is my hope that this series will help you to become more confident and skilled with coaching people with precise and targeted forgiveness statements. No matter what level you are at with your creative forgiveness coaching, I feel certain this series will ignite even more confidence and passion in you to help others release what no longer serves them. -How to form forgiveness statements using the root memory found in the EPT procedure. -and details of constructing positive affirmations that “fill in the space” or “write a new story"—the space is what is left when you unload all that pain from a person’s body, mind and spirit. Part 2 also includes lots of examples of forgiveness statements and positive affirmations that you can listen to over and over, to get a better feel for how to incorporate all these ideas into one incredible EPT session. In this episode I will be increasing your understanding and skills even further with How to Form Great Forgiveness Statements. -How the first 3 steps in the EPT 4 step strategy (focus, find it, fix it and forgive it) set the stage to open the door wide open for massive healing through forgiveness. -What is Total Absolution and when is that needed? Welcome to episode 51. This is part 2 of a 4 part series on Forgiveness, titled: Freestyle Forgiveness: Taking Forgiveness to Another Level. -How to form forgiveness statements using root memory found in the EPT procedure. 1. Look at the statement that describes the root memory. 2. Use this statement to form forgiveness statements that release beliefs that no longer serve this person’s life. 3. Ask yourself what you would have to believe that isn’t true if you went through that same stress. 5. Remember to forgive what you believed that isn’t necessarily true. 6. Fill in the space with the statements beginning: Without this pain I am free to. . .
what am I free to do? what am I free to feel and enjoy? what am I free to heal? what am I free to create? In this part, I’m going to expand on concepts that help you to immediately take your forgiveness statements to the next level. The concepts I’m referring to are found in my book, The Forgiveness Doctor in chapter 6, Let’s Talk About Forgiveness. In my book they are referred to as Five Tips For Forgiveness. These tips are your go-to power players when it comes to getting better at creating forgiveness statements for your clients. Welcome to episode 50! This episode is the first of a series of 4 on the topic of forgiveness. EPT is a 4 step healing strategy that is structured to open pathways to true forgiveness within the body, mind and spirit. The EPT focus on forgiveness ignites miraculous, spontaneous healing by coaching each person into their own unique and relevant “forgiveness moment” through targeted forgiveness statements. EPT practitioners become experts in forming relevant forgiveness statements with the power to increase break through healing at every level of body, mind and spirit. This series of 4 podcasts is designed to help EPT practitioners to increase their skill and confidence in forming forgiveness statements that catalyze greater healing transformation in their clients. Even if you are not an EPT practitioner, you will find value for your own life by increasing your knowledge of the art of forgiveness. Kelly Lenart is a certified EPTworks™ Practitioner. She is located in Cincinnati, Ohio. Kelly takes private EPT appointments and she also offers an online coaching program called 20 in 12 that includes Emotional Polarity Technique™ sessions as part of the 12 week coaching package.Kelly is passionate about helping others change their life through more innovative holistic approaches such as EPT™. In this interview, Kelly talks with Dr. Annette Cargioli about Emotional Polarity Technique™, what it is, how it came to be and what is the vision for the future of EPT™. The Seven Stages of Healing is a scale that measures where a person is with regard to their spiritual awareness. The higher a person is on the scale, the faster they can respond to any healing modality.Since people are multi-dimensional, a person can be in one stage of healing with regard to their body image, another stage of healing with regard to their marriage relationship, and yet another stage of healing with regard to their financial health.As you begin to understand the seven stages of healing, you will see the value of just knowing this scale and how it explains where you have been, where you are stuck and where you are going. Early on in my emotional healing work, I discovered a few shortcuts. These shortcuts have become invaluable to the process of EPT™. The first one, Putting It All Together , was born out of my need to know how many emotional issues were necessary to move this person forward today. Way back in 1989, I was transforming my chiropractic practice into a holistic healing practice that included chiropractic care and nutritional advice. I had begun using muscle testing as a tool when consulting with patients. In 1991 when i took NET with Scott Walker, I was ready for more energy work training. I was greatly influenced by his work. By the end of 1995, I had developed a simplified emotional energy correction with magnets and breathing. I had also moved deeply into the realm of the power of forgiveness. My Christian background had taught me how forgiveness works in my soul salvation. However, I was learning how forgiveness is simply the immense power of Christ's love for all who honor it. No matter what your faith, you can see and feel the power of healing in Christ's love. It just is. You have mapped out your dream life full of all the experiences you still haven't enjoyed fully. You may even have a fancy vision board with pictures of all the cool stuff you've decided to manifest in your life. This is simple, right? All you have to do is keep your focus on your dream long enough and it will eventually appear. The reality is you have a drawer full of dreams that you have never manifested and it's been too long. It's time to take another look at where you are stuck and exactly what is keeping you from driving to your dream destination in life. In this podcast you will learn 2 things that stop you from Manifesting your dream life. I'll also include some dynamite forgiveness statements to help you release these old patterns and drive on to your dream destination in life. There is a powerlessness about debt that is tangible. There is a sense of suffering, guilt and not having enough in the experience of owing more than we can pay. Hello Everyone! In this podcast you will learn how forgiving the invisible debt from your childhood can help you to release the financial debt stuck in your life now. Debt is just money you owe. It can be eliminated by paying the money you owe. The debt is not your problem. It is the way you feel about the debt that creates your suffering. Once you enter that state of suffering, guilt and emptiness; it becomes impossible to take power over debt in your life. These negative feelings about money and debt usually come from childhood. You absorb the feelings your parents hold about money and debt. Have you ever had a problem you just couldn't change? You know what I'm talking about; stuff like that extra twenty pounds you just can't seem to keep off or credit card debt that never goes away or a relationship that makes you feel devasted every time you think of it. In this podcast, I'm going to talk about idols. Now I'm sure none of you have a golden calf in your living room that you bow down to - I'm referring to the modern day idols that we bow down to , give all our attention and focus and believe they can make our lives better or get us what we crave. -what a modern day idol looks like. -and how doing this will allow immediate reconnection with your divine source. The Forgiveness Doctor Chapter 5: EPT's Simple Four Step Formula: Focus! Find it! Fix it! Forgive it! As a holistic doctor, I get to help people with problems that have failed to respond to traditional medical care. I have learned that physical and emotional suffering that gets stuck in your life is usually coming from previous experiences where you heart was broken. It could be your parents divorced and you lost your family, or a parent or friend died. A teacher or coach may have humiliated you with criticism in front of your peer group. You may have been a child who was always alone and left out. You may have been a witness to your father abusing your mother or a sibling - or you. Your heart could have been broken just being left by your mom because she had to go to work. In this podcast I will give you the longest chapter from my book, The Forgiveness Doctor. It includes all the nuts and bolts and more. There are things that can happen that are really hard in life. I'm talking about the over-the-top traumas that are devastating to the individual and to humanity itself. Things like witnessing a murder at age 4 and then being raped at the burial site or having a family member brutally murdered for no reason. To talk about forgiveness in these traumas can seem heartless, and uncaring. The pain is so excruciating, and the thought of forgiving the offender seems impossible. You must remind yourself that forgiveness is not just about "freeing the offender". Forgiveness is about freeing the one who was offended. Over the past 30 years, I've learned some incredible ways to live life better - a little more in harmony with our creator and all the abundance that is meant for you. In this podcast, I'm sharing some of that "natural health" knowledge that I've been blessed with. Chronic coughs, runny noses, sore throats, headaches, tummy aches - with five kids, I've seen it all. My youngest is now a sophomore in college and I am proud to say, we never had to treat our sick kids with antibiotics or medical intervention. We have developed a good reputation in our community, providing natural health care to children. While vitamin C and plenty of water are always recommended for infections, I'm giving you 11 more practical and effective natural cures you can use to help your sick kids. Hi everyone! The incredible Linda Collier will be joining me in this podcast. We're going to give you all the reasons you need to take Emotional Polarity Technique Core Training. We are positive that EPT Core Training is one of the best life investments and personal experiences you will ever know. EPT Core Training has immeasurable value as a hands on training compared to online trainings that lack the in person support and education. 1) You love helping people, in fact you have been helping people your whole life. In EPT Core Training, you will become an expert in helping people overcome the limitations from their past - the limitations that are keeping them from experiencing greater health, happiness and success right now. You will learn to quickly, almost mystically identify the emotional cause, the root memory that is causing their physical and emotional suffering. Once you uncover these significant hurts in another person's life, you will know exactly how to release the pain, opening up space for natural, divine healing transformation. 2) EPT makes you an expert in helping people heal some of the most difficult life situations like divorce, death, cancer, abuse, autism, trauma, depression, anxiety and failure. Once you realize how it is possible to heal and release the suffering of the worst life traumas quickly and painlessly - how you view life completely changes. Did you know that anxiety can be caused by a previous head injury or brain injury? -A simple test that shows if you or your client has an unhealed head/brain injury. -How to use EPT to release the energetic trauma to help speed up the tissue healing. -How to use a magnet to speed up the healing of the brain. -What the best nutritional supplement you can recomment to heal brain injury. I will also have everyone on the call, do the simple test I will tell you about. I will give each person who tests positive for an unhealed brain injury their specific nutritional protocol and magnetic protocol - including how long it will take. I will also choose one person with an unhealed head/brain injury to do an EPT session with. Now that we've explored the overall look of EPT™. We're going to get technical in this chapter, showing how it's done and why it works. If you are new to EPT™, feel free to skim this section and come back to it when you are ready to learn the procedure. I've included all the nuts and bolts so as you become proficient in EPT™, you will be able to use this chapter as a resource and a reminder. Dr. Annette does an EPT session to demonstrate how to use the statements of congruency: Show up. Pay attention. Tell the truth and Let go. In this healing session, Dara would like to stop "checking out" when her husband and teen son are having conflicts. Our testing reveals Dara is not congruent with "showing up" or "letting go". We use energy, intuition and forgiveness to laser in on exactly what keeps Dara from being her best self in this stressful life situation. Listen in as Dr. Annette uses words to transform the energy in this family to align more with love. She also weaves family constellation dynamics into this individual session to support Dara's husband and son healing as well. Today I'll be talking about the EPT concept I call Statements of Congruency. -what the statements of congruency are. -why these statements are incredibly useful in helping people get unstuck with the actions they must take to heal anything and everything. -and finally, I'll explain how to use these statements of congruency as a scale that will help you navigate your client's inner world of beliefs, ideas and stored trauma more efficiently. In episode 9, I talked about how to use the concept of "Stages of Healing" as a scale that informs you where you are STUCK SPIRITUALLY with regard to any focused issue or problem in your life that you are wishing to heal. Statements of congruency give you information about where you are STUCK with ACTIONS YOU MUST TAKE to heal anything and everything in your life. "I hate him and I'm over it! Unfortunately, I still have to deal with this man because we share children." For many; divorce doesn't make a difficult relationship any easier. Putting your marriage relationship to death, doesn't fix the pain, failure and frustration. Long after the divorce papers are signed, you may carry the emotional scars of being deeply hurt and disappointed by the one you loved, trusted and made babies with. Like death, with divorce there is a real sense of loss; an emptiness, failure and broken heart. Today you will learn three essential steps you must take if you want to heal after a divorce. I will also give you some incredible forgiveness statements to say and breathe through to help get you through these three vital steps. 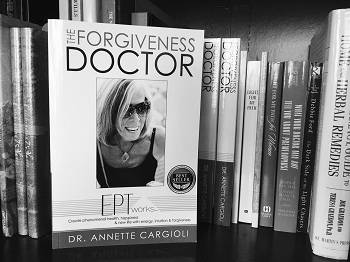 In this podcast, you get to listen to chapter 3 from Dr. Annette Cargioli's book, The Forgiveness Doctor. One of the goals of EPT is to change uncomfortable emotional reactions in the body so you can feel better. Magnets assist in making that possible by changing the electromagnetic and biochemical programming of an emotional event. Not only do you feel better; you open up to possibilities of re-writing your life script the way you would like to live it. Where I learned about magnets for healing the body. What effect the north and south pole magnetic energies have on living tissue. Why using magnets in energy healing is not only helpful to the person being healed but also helpful for the healer. Finally, I will give you some specific ways you can use magnetic energy as your own energy replacement therapy. I'll also include information about where you can buy a set of magnets to use for yourself. In this EPT Practitioner Interview, Dr. Annette Cargioli will be interviewing fellow EPT Practitioner Dorothy Tomasic. Okay, to answer your question about the difference between EPT and EFT. EFT was developed by Gary Craig in 1994 - Ironically, this was about the same time I began teaching and developing EPT. It was years after I developed the core of EPT that I learned of Gary Craig and EFT. EPT was different from EFT in that it was not a "self-help" therapy, but a collaborative therapy where two or more people come together with a conscious intention for healing with respect for the greater connection of consciousness being essential to the movement of energy and expansion of consciousness. In other words, in EPT we recognize the unseen energy connection that exists when two or more people collaborate for the good outcome. I call that unseen connection - Love or God or the Holy Spirit. 2) A Respect and honor for the unseen force of love that connects us all when we collaborate for the good of others. This combination speeds up the healing process and serves to raise consciousness of the energy of divine love. It is our awareness of our connection to this divine loving energy that awakens us to the love that we are and have always been and will always be. In this EPT Practitioner Interview, Dr. Annette Cargioli will be interviewing fellow EPT Practitioner Penny Langley. Dr. Annette Cargioli interview Parkinsons Patient Linda Collier and her docter, Dr. Ron Cargioli about the specifics of the all natural amino acid therapy that stops the symptoms of Parkinsons. -Dr. Annette Cargioli talks to Linda Collier and Dr. Ron Cargioli about Linda's Symptom recovery of Parkinson's Disease. -You will learn about an all natural nutritional therapy to eliminate the symptoms of Parkinson's. In this EPT Practitioner Interview, Dr. Annette Cargioli will be interviewing Master EPT Practitioner Steve Olsen. This is part 2 of a 2 part podcast titled: How Your Built-in Defense Pattern Keeps You Unconscious. In part 1, I went into detail to describe the 5 basic defense patterns that people use when they are triggered by fear in any situation. Your defense pattern is a sort of automatic programming you were born with. This automatic response programming gives you a way to "react" or "respond" to things in your environment that threaten you. You don't even think about it - it just happens - as a way of protecting you from getting hurt. In part 2 of this podcast, I'm going to briefly review the 5 basic defense patterns. If you want detailed information, you can check out part 1. This is so valuable because when you recognize these reactions, you know the person has just "gone unconscious" in their behavior. This recognizable core defensive reaction becomes a predictable way to know that you or another person is afraid. It is a sign that you are just going through the motions in life without regard to creating anything new or better. In addition to giving you a brief review of the 5 defense types, I'm going to give you some dynamite forgiveness statements and affirmations to help raise the level of consciousness of any one defense type. EPT is a healing modality that strategically raises one's conscious awareness and frees you up to create a new and improved life experience. Hopefully, this information will raise your consciousness so that you can start to notice all those times you are just "going on autopilot" because you stopped using your power to be present in a perceived threatening situation. When you show up for your life in present time consciousness, you open yourself up to infinite possibilities for conscious creative decision making that creates new and improved outcomes in your life. The basis of these 5 defense types comes from Barbara Brennan's book, Light Emerging. In this EPT Practitioner Interview, Dr. Annette Cargioli will be interviewing fellow EPT Practitioner and younger sister Sherry Hamilton. Have you ever known someone whose reactionary behavior is rediculously predictable? Flor example: Every time you say what you want, this person will want the opposite. Every time you get into a deep discussion and you think it's going well - this person will turn it into a full on conflict and then blame you for causing it. Your defense pattern is something you were born with. You need a response to things that threaten you - an automatic response; one you don't even think about - it just happens - as a way of protecting you. Your defense pattern is the defense programming that you were born with. -What is your unconscious go-to-reaction when you feel threatened? -You will also learn how to recognize these unconscious reactions existing in others. Everyone has at least one automatic defense pattern that shows up without you even thinking about it - it gets played every time you feel threatened or afraid. -I will teach you about the Defensive Aspects of Character Types. These descriptions are taken from the energy healing classic book, Light Emerging by Barbara Brennan. I'll describe the 5 basic defense patterns that people use when they are triggered by fear in any situation. In part two of this podcast, I'll also give you some affirmations and forgiveness statements that you can use to become more conscious when you find yourself in life situations that trigger your predictable unconscious patter of defense. ADD stands for Attention Deficit Disorder. Chances are you know someone who has one of these diagnoses. -Finally, I'll be talking about how environmental influences can create or contribute to attention deficit disorder and how EPT can help. -If you hang in there until the end, you will also learn about an essential oil that can balance a person with ADD. Join this Hangout On Air and get great content from Dr. Annette Cargioli, Penny Langley and Linda Collier that will ispire you, boost your healing business and help you get on the road to reach your success destination. -Achieve your goals faster and easier. -Support you to create your dream business. -Make your process of radical transformation more fun and enjoyable than you can imagine. Audience members will be able to ask questions in a text box during the Hangout. Want in on all my personal secrets to a healthy life? With EPT you begin to love and care for yourself more than ever. This transformation opens you up to taking good care of yourself, maybe for the first time in your life. In the growing world of vitamins, herbs, homeopathies, eating plans, holistic programs and an increasingly toxic environment, it can be overwhelming to change your lifestyle in the easiest and most effective way to better your health. Im going to share my favorite natural remedies for your improved life and health. There will be lots of information, but I guarantee it will help you sort through the most important changes for you to make now and it will also give you practical ways to improve your health with less effort. In this podcast, Dr. Annette Cargioli interviews her daughter Paige Cargioli. How EPT Can Help You Heal from your Inhereted Emotions a.k.a "Generational Memory"
You're going to learn: What is a generational memory, what scientists are confirming about generational memory, how to identify if the toxic emotional pattern is inherited from a previous generation, you will also learn how exactly to use EPT to release the energy pattern of generational memory. Welcome to Episode 6. This episode is called 'Help For Borderline Personality Disorder With Emotional Polarity Technique.' In this episdoe you will learn how emotional polarity technique provides unique emotionally energetic based therapy for people diagnosed with Borderline Personality Disorder. You will learn why these people become cutters and why they are so prone to suicide and suicide threats. I'm going to talk about what is actually going on in the brain of a person with Borderline Personality Disorder that creates so much of their suffering. I will also discuss what is necessary to heal this disorder, how long that may take, and what is the best EPT therapeutic approach to help someone with Borderline Personality Disorder. Thanks for joining me for Episode 5, "Faith To Raise The Dead." In this episode I'm going to talk about raising the dead in your life. Maybe your faith is dead, maybe your relationship with a close family member is dead, it could be your marriage has died, or your relationship with your children, or your relationship with your body, or maybe the part of you that believed in love and hoped for a better life, has died. In this episode you will learn how EPT can bring life back to the things in your life that are dead. First a little warning, if you are offended by bible scripture, you may not want to listen to this podcast. I'm warning you now, I will be sharing with you scriptures from the bible where dead people were brought back to life. I believe there is a lot of wisdom in there to guide us in manifesting the resurrection of life out of death. Can a Dead Person Keep You From Being Well? This Episode 4 is titled, "Can a Dead Person Keep You From Being Well?" In this episode I will talk about how the energy of a dead person can make you chronically ill and that many times when you are not getting better it is because you are carrying the pain or illness of someone who has died. You will also learn why this is not weird or complicated and probably happens more often than you think it does. Finally, I will talk about how an EPT practioner can easily identify if this, your close connection with someone who has died, is actually the cause of your chronic pain or illness and how energy, intuition, and forgiveness, how using that you can quickly release that stuck energy and immediately feel better and move on with your life. Today is episode 1, I am giving you the Preface and Chapter 1 of my new book, Listen, Love, Give. You are going to find out who I am, how EPT started, who needs EPT, how EPT works, the importance of perception, the emotional toolbelt, the concept of "No longer serves you well," the scientific theory of why EPT works, and most importantly how EPT is like Google for your life problems.